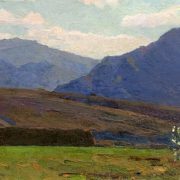 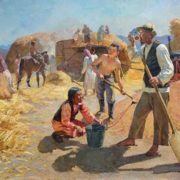 Socialist realism painter Fyodor Stukoshin was a bright representative of Soviet art, and most of his creative life he spent in Kyrgyzstan. 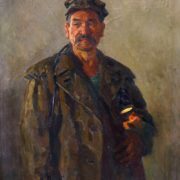 Painter and teacher, he was a Member of the USSR Union of Artists (1949) and veteran of Great Patriotic War (1941-1945). 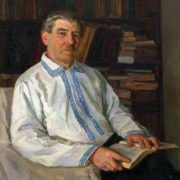 Born in the village of Razrytoe of Smolensk Province, Fyodor Stukoshin spent his childhood in Siberia. 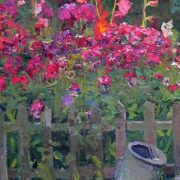 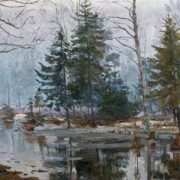 In 1936 he graduated from the Painting Department of the Omsk Pedagogical College of Art of Mikhail Vrubel, where he studied in the workshops of V. Trofimova and S. Feldman. 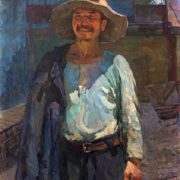 After graduation he worked as an artist in the Omsk theater, engaged in registration of performances, creating costumes and scenery for the dramatic productions. 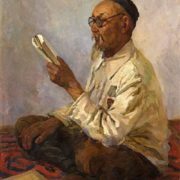 However, In 1940 he moved to Frunze, the capital of Kyrgyzstan, where later moved his entire family. 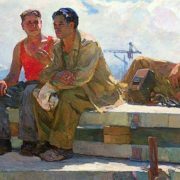 In 1941, with the beginning of the Great Patriotic War the artist served in the 27th Artillery Regiment of the legendary Panfilov division. 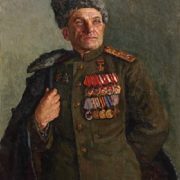 Besides, he participated in the battles for the defense of Moscow. 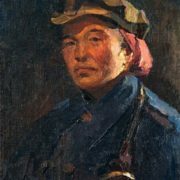 Unfortunately, in August 1944, seriously wounded near Riga, he got into hospital, and remained there until February 1945. 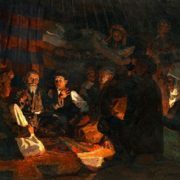 Of course, he received awards for Military Merit. 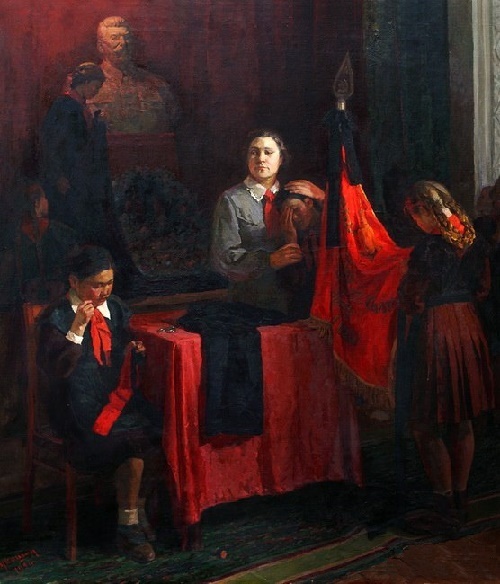 In particular, the Order of the Red Star, medals “For Defense of Moscow”, “For Service in Battle”, and “For the victory over Germany in the Great Patriotic War of 1941-1945”. 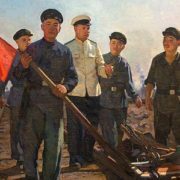 Meanwhile, after demobilization in 1945, he returned to Frunze. 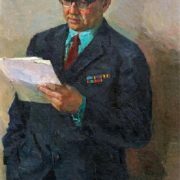 During these years, he created the first known paintings: “Pick the Winner” (1945), “Portrait of a Hero of the Soviet Union M.D. 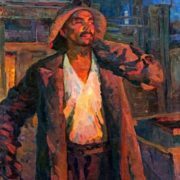 Siyanin” (1948), “Storyteller” (1948), “Railway workers” (1950 ) and other works, which entered the golden fund of the Soviet Kyrgyz art. 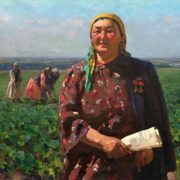 In addition to teaching in the Frunze Art College, Stukoshin was a permanent participant of regional, republican, and all-union art exhibitions. 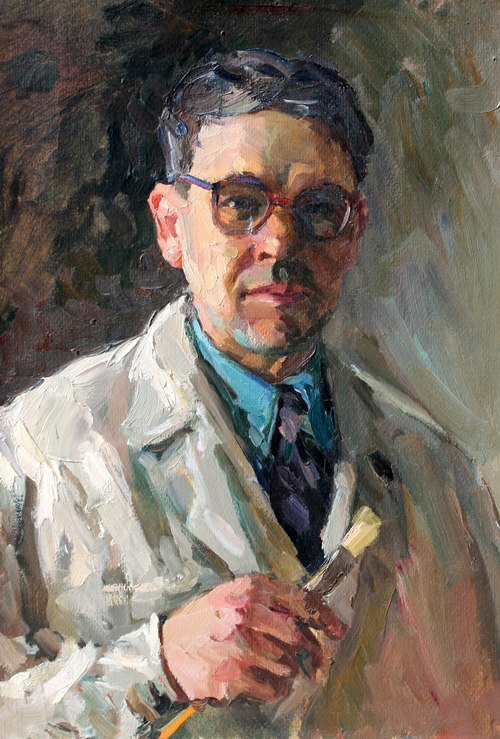 In particular, in Moscow (1946, 1949, 1958, 1966). 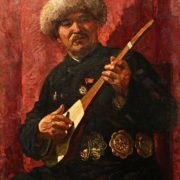 Besides, he participated in the decade of Kirghiz Art in Moscow (1958), and had solo exhibition in 1960. 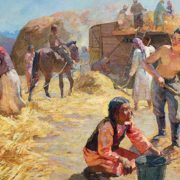 No doubt, Stukoshin has made a great contribution to the development and establishment of professional fine art of Kyrgyzstan. 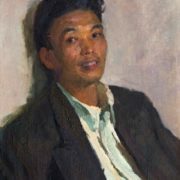 Moreover, he trained a whole galaxy of artists. 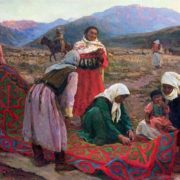 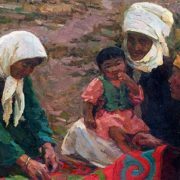 And as a result, entered the history of art in Kyrgyzstan, as one of the leading painters of the postwar period. 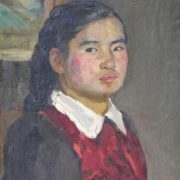 Thus, his creative legacy in all genres of painting is more than two and a half thousand works. 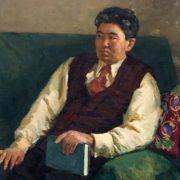 Fyodor died February 3, 1974 (Frunze, Kirghiz SSR). 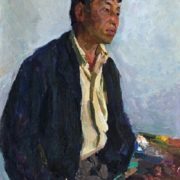 His works are in the Kyrgyz National Museum of Fine Arts, Omsk regional museum of Mikhail Vrubel, and other museums, galleries and private collections all over the world.